With sensational headlines in the news every week about Islamic extremists, mosques and even instances of burning the Qur’an, Nabil Echchaibi, Assistant Professor at School of Journalism, University of Colorado, will help to set straight the fact and fiction behind the media’s portrayal of Muslims in America and around the world. 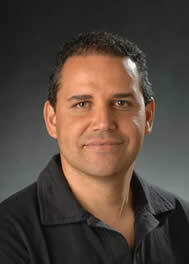 Nabil is currently an assistant professor in the School of Journalism at CU Boulder. His research and expertise focus on the intersections between Islam, Arab popular culture and the media. Most recently he has studied the new public articulation of identity and religion among young Arabs as a result of satellite media. Muslim identity in diaspora is increasingly shaped by a shared political and cultural consciousness heavily nurtured by transnational and interactive media. He will discuss ways in which America’s view of Muslims is largely sensationalized through media spectacle. Nabil was born and raised in Morocco. He received his BA in English Literature from Mohammed V University in Rabat and his MA in Journalism and PhD in Media Studies from Indiana University – Bloomington. He will soon publish a book on the role of diasporic media anong young Muslims in France and Germany. He has appeared in the Denver Post and the Huffington Post.